T20-T23 Series and T30 specific matters only. NOT for T25-Retro. I've been searching these forums for the better part of a year now and have had no need to register, until now. I have been battling the "blink of death for the T20 T21 T22" and now I have had a breakthrough on a T21. I recommend replacing the ADP3421 chip on the board. I saw these somewhere on this forum, although the author just casually mentions it, w/o giving some thought that he might have answered a major question. This new chip for this T21 came from a stack of bad boards that have various other problems, but not the blink of death. NOTE: All links to PC-Doctor software hosted by me are dead. Files removed 8/28/12 by manufacturer's demand. Hmmm...I wonder if I can even get my soldering iron in there...hmmm It might just be a bad solder joint. Then again, I just ordered a heat gun and IR Thermometer to attack the T4x GPU problem...maybe I will try that too! Thought I would order a couple of those... when I got to the checkout it was $16 for shipping (!). Found out that PCHub.com is based in Singapore. My inclination is that there's a short between some of the pins in this area or an open circuit. The short could be from a "tin whisker" which has formed between two adjacent leads. 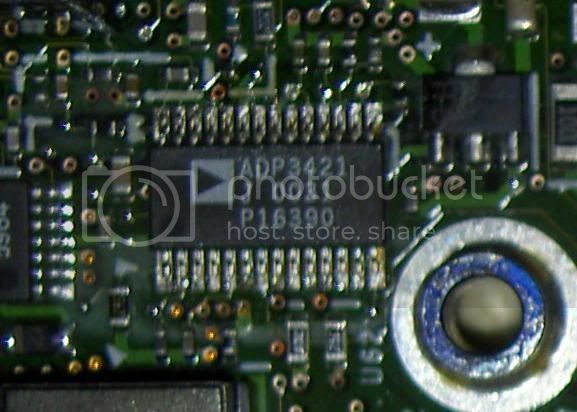 A good scraping between the pins of the ADP3421 (with the power disconnected naturally) and a close inspection of the soldered leads might be a good first attempt at a fix. I have replied once with this solution for a BOD problem. I also wrote in the same post that replacing the ADP will solve the BOD for some of the boards with a BOD problem but not all BOD problem boards can be fixed by replacing the ADP as there can be several causes for this BOD problem. How about just re-soldering all the legs on that chip? I do not believe that there is a real short or open circuit around there. It is more likely that there is a tiny bit of resistance in one of the solder leads. Preventing the chip from settling and also making the chip more sensitive to noise spikes from VCC, which happen to be the 3.3V. replacing the chip did not solve the problem. Like msmax, I am also without any BoD boards to try with, but I am still searching, hoping to find one soon. With a quick knock on wood, my T21 has not needed this sort of treatment. If it ever does, I'm at least armed with something to try. BTW: I *may* be able to source these... I'll look for sure. Common sense to some of us is unfortunately the higher education others strive to attain. SMA wrote: Like msmax, I am also without any BoD boards to try with, but I am still searching, hoping to find one soon. I have two of them, and I am going to try it this week...probably tomorrow night. As Msmax said, he posted in the first two threads, and there doesn't seem to be a 100% success rate. rkawakami wrote: Thought I would order a couple of those... when I got to the checkout it was $16 for shipping (!). Found out that PCHub.com is based in Singapore. But for 10 including shipping the total is $ 48.89 or less than $5 apiece. Might be worthwhile going together to get a better price. From everything I have read about BOD problems, I am inclined to say that it has nothing to do with solder problems of the ADP3421. I took a look at 2 of my BOD boards under the scope and the solder looks fine: no cold joints, no voids, no cracks or loose pins. I also think that if the Analog devices parts are indeed failing it is a result of poor design (either of the part itself or the surrounding circuit). So it will probably occur again (no news there). I am in for (2) ADP3421 devices if someone bulk orders. This was mentioned in detail back in January in the main BOD thread by augustsamame in Lima Peru of all places. "It is our experience that in 90% of all cases, replacing the ADP3421 IC will solve the BOD problem, but all the other secondary voltage regulators will need to be checked too or the replacement ADP will fail eventually, sometimes within hours. " He had I think, the best analysis of the problem that I have read. Anyone notice about input current? I've also got 2 BOD Thinkpad T20 and T21 from my friends just few days ago. I'm now looking into the problem as well as far as I've read the articles and findings here. I'll try to inspect the board and just ordered some ADP3421 for replacement. Anyway, my point is, did anyone noticed that the input voltage and current of the power supply, original from IBM, was 16V and 4.5A? Yes, it's official power supply. The question is, would this current blow anything in the motherboard? I'm not a pro in electronics, but I've read carefully on the bottom of the laptop reads: 16V and 3.36A. This 16V 3.36A type of power supply adaptor used to be for the older Thinkpads like the 600 series (TP600, 600E and 600X). I just don't know, even if I replaced the ADP3421 and if that works, would this 4.5A blow anything out later? Like, another BOD after a while? I tried before using a 3.36A power supply and it also worked for T20 and T21. Quite stable. I just knew that higher than specified current will work, but it may also blow something up. Any idea from pro users alike? I wish to understand more too. Display Lid Warped / Bent? Here Comes the Ultimate 5 Minute Fix!